In June of 2013, I had the great pleasure of visiting Bun E. Carlos’ “drum barn” to pick up a 1920’s Ludwig Wild Rose Triumphal (see NSMD Featured Articles, January, 2014). Bun E. was very kind to give me a tour of his amazing drum collection. I took quite a few pictures with my trusty Nikon D800 expecting that I would never see a collection like this ever again. Recently, I started looking through these pics, zooming in on the details that a wonderful DSLR allows. No, this is not an advertisement for Nikon! My eyes kept returning to the far left corner where many exquisite and rare 1920s-1930s Ludwig & Ludwig drums were placed. Third from the left, next to a Ludwigold and Stipelgold, there appeared to be a 10-lug, non-engraved Black Beauty, circa 1920s (p-338 strainer), with gold-plated hardware. Actually, there was some engraving but only the “Ludwig – Chicago - USA” logo. No scroll – no florettes. While the drum showed some wear-and-tear for its ~90 year lifespan, I was pretty sure there were very few of these around in any condition. Eventually, the allure became too much and I emailed Bun E about selling me the drum. To make a long story short, the drum made its pilgrimage from Rockford, IL to Carmel, IN about a month later. At the time, I did not know very much about these drums, but my curiosity made me dive deeper. So while I nailed down the drum’s identity, I was at a loss to find any of the previous owners prior to Bun E. I keep wondering who was the drummer who bought and played this drum almost 90 years ago. 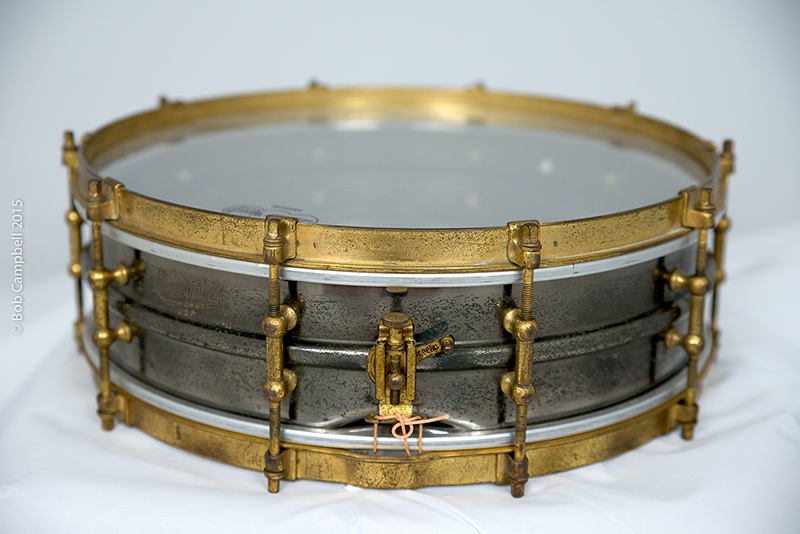 I wish I knew… In a previous catalog, Ludwig stated, “You can play better on a gold drum. You wonder why, but it is true.” Well, I’m not so sure but I am to find out! All said and done, this is a pretty rare drum. I feel privileged to be its custodian for the next generation. Now it’s time to send it off for a bit of gentle cleaning and preservation (by Mike Curotto, one of the few people I’d trust with such a delicate task). Hopefully, I’ll remember to send some before-and-after pics! Mike does amazing work. Best wishes and keep hunting for those musical treasures. Many thanks to Bun E Carlos, John Aldridge and Mike Curotto for their help with this article; they are a wealth of knowledge and inspiration (no pun intended! ).